Raashi khanna looking gorgeous in bridal net lehenga in Bengal tiger movie. Saree is a beautiful 6 yards of clothing liked by Indian women.It looks immense prettiness to women.No other clothing can beat sarees in their traditional look.The varieties of sarees range from simple plain sarees to heavy designer sarees.Of all the sarees types, silk sarees gives you traditional look and rich look when worn for special occasions like a wedding.One can get inspired from our celebrities in choosing sarees.They keep updated on modern trends.Check out these south indian celebrities wearing silk sarees for a wedding event. Latest trend of silk sarees is using evergreen kanchipuram(kanjivaram) silk sarees,Uppada silk sarees,Banarasi Sarees and Pochampally ikat silk sarees. Madhuri dixit attended YPO (Young Presidents' Organisation)Event held in Goa in Vineet and Rahul long full sleeve Salwar kameez with pink silk dupatta with zari on it.She finished her look with temple long chain. 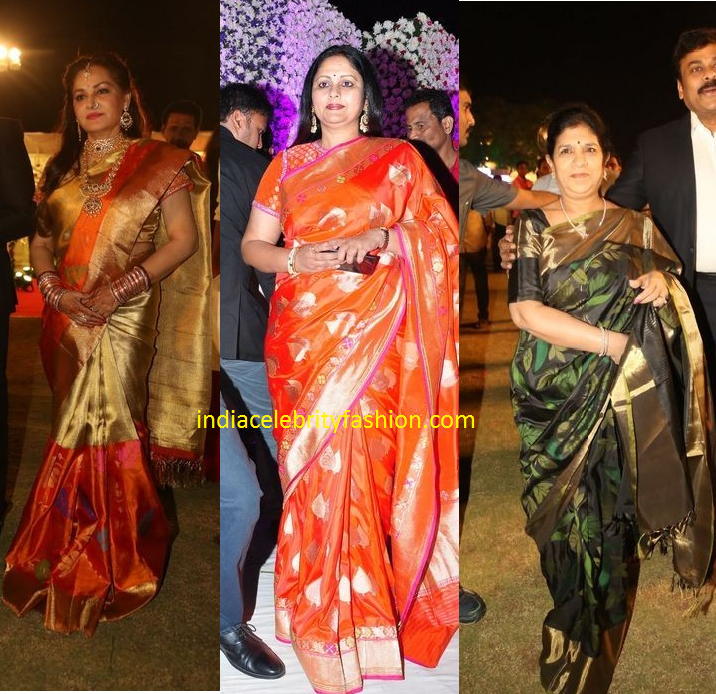 Sridevi attended Jayaprada's son Siddharth's Wedding reception in a light mint color sabyasachi net saree with full sleeve blouse.She finished her look with diamond emerald earrings and stone bindi.She looked gorgeous as ever! 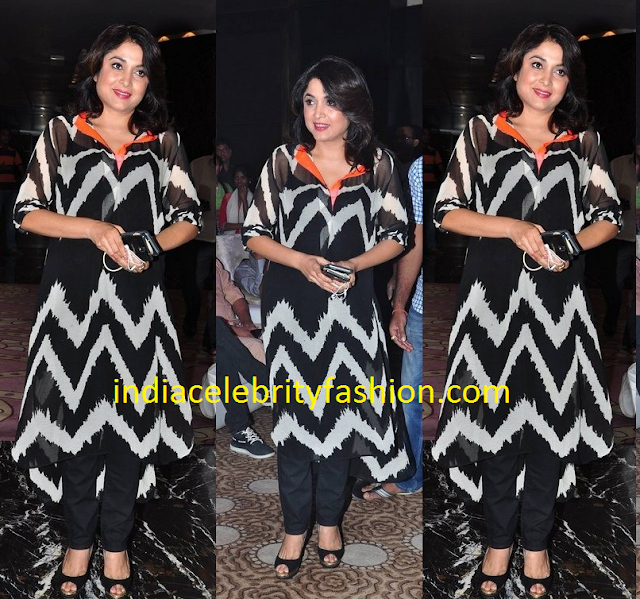 Yesteryear actress Ramya krishnan attended MMAK audio launch in black asymmetric kurta with white stripes on it.She finished her look with black pant,short hair and peep toe heels.She looked good! Sonal chauhan donned a Jayanti reddy label red lehenga with full sleeve blouse and embroidery work lehenga for the special screening of Size zero movie.She looked good.Sonal chauhan dressing is similar in recent events which you can check here. Meena attended the audio launch of Mama manchu alludu kanchu movie in a pink salwar kameez with half sleeves.She finished her look with gold color clutch. Regina cassandra attended the special screening of Anushka's Size zero movie in a Asmita Marwah outfit.She completed her look with curls hair,finger rings and black heels.The crop top gained my attention much! Rakul preet singh picked a Asmita marwah one shoulder black dress for the special screening of Size zero movie.She completed her look with short hair with curls and peep toe heels.Love her heart shape top! Lakshmi manchu looked stunning in a light peach color net lehenga at yesteryear actress Jayaprada's nephew sangeet ceremony.She finished her look with diamond jewelry. Sridevi picked a sabyasachi mukherjee green net designer saree for a recent wedding event.She completed her look with sleeveless red glitter sequin blouse,red glitter clutch,red bindi,red lip and beautiful kundan jewelry.She looked beautiful as ever! Deepika padukone looked stunning in & other stories in white sweater dress during the promotions of Tamasha movie in Delhi.The actor finished her look with updo hair,zara shoes and dolce & gabbana earrings. 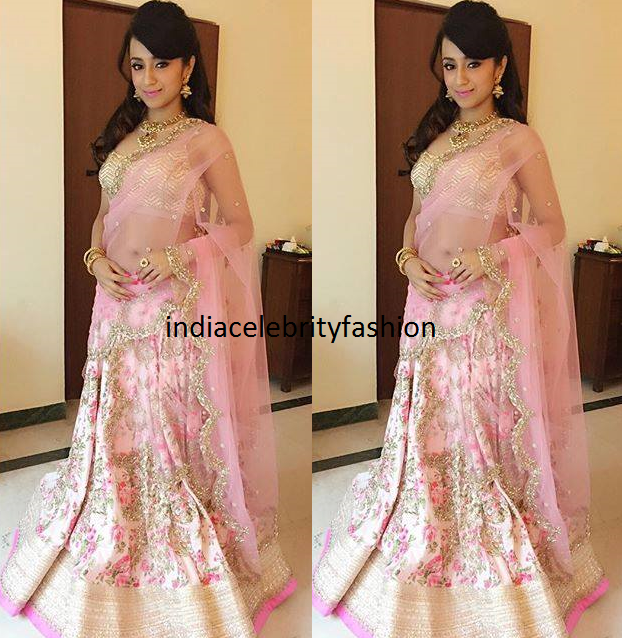 Regina cassandra picked a Zulekha j Shariff pink saree gown for the press meet of her upcoming movie Shoukyam.She finished her look with cuff and finger ring. Tamanna bhatia attended Sajid khan birthday party in a black sleeveless Urvashi Joneja dress which has blue,red and green stripes on it.She finished her look with curls hair,pink lip and aldo black heels.Loved her dress! Kangana ranaut looked beautiful in Abu jani sandeep khosla designer white net at the wedding reception of Masaba gupta and Madhu mantena.She finished her look with diamond earstuds and red lip.Loved her designer boat neck blouse. Tabu attended Ajeenkya DY Marathi film fare awards event in a simple black Abu jani Sandeep khosla sari with silver glitter border paired with silver work blouse. 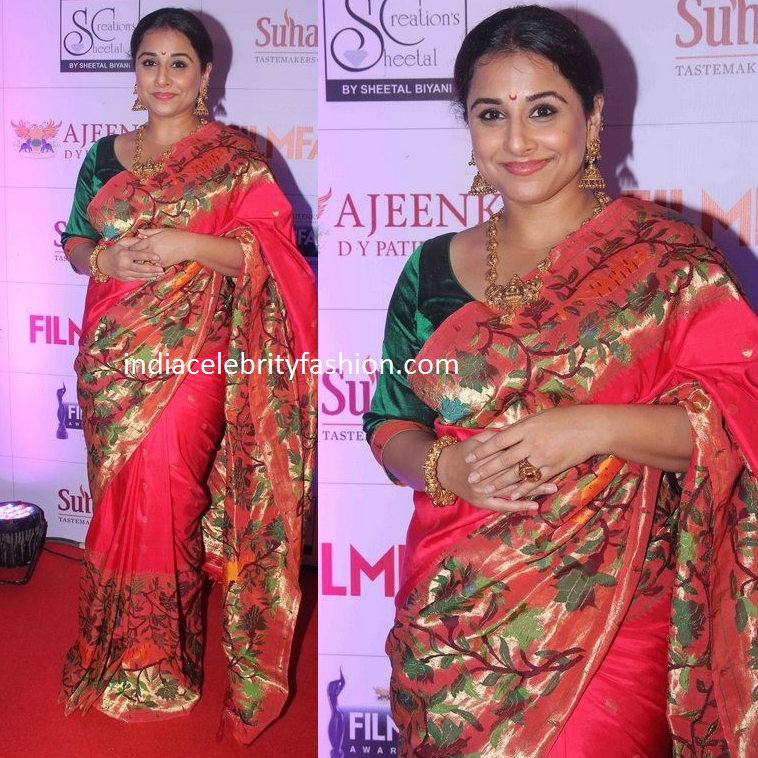 Vidya balan attended Marathi film fare awards 2014 event in a bright red Paithani saree designed by Gaurang shah.She completed her look with Nakshi gold jewellery.Love her bindi! Madhu shalini looked beautiful in peach color netted long salwar kameez with kundan work on it at Cheetaki rajyam movie success meet held in Hyderabad.She finished her look with fishtail braid and jhumka earrings! 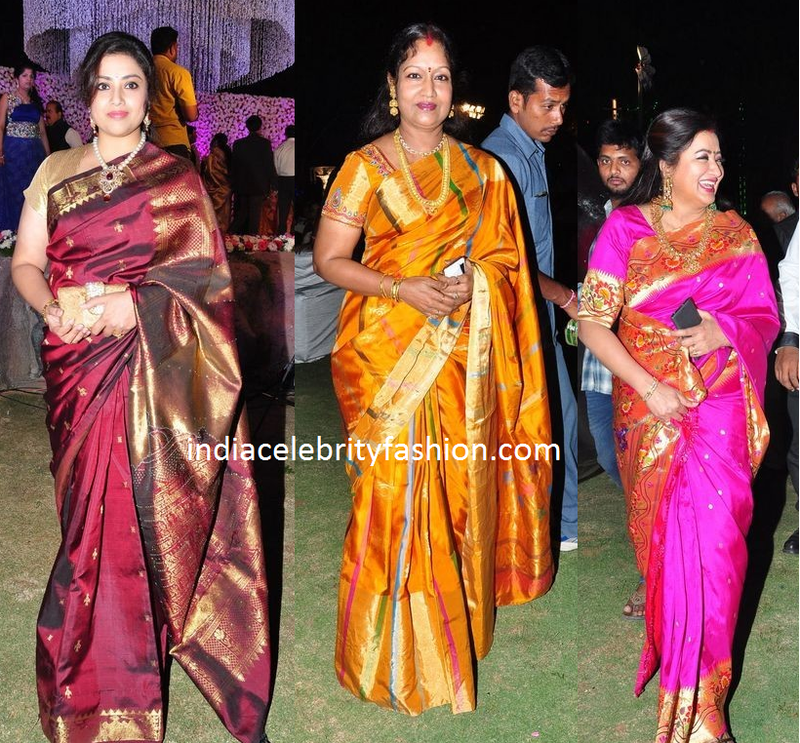 Lakshmi manchu donned a yellow anavila linen sari for the curtain raiser of her dad's(Mohan babu)40 years in Telugu cinema.She finised her look with big red bindi,sritikaa jewellers chandelier earrings adn fashion long chain.She draped the simple sari well! We can see her adorable daughter vidya nirvana manchu anand in the picture! Mira rajput attended Masaba gupta's Mehendi ceremony along with Shahid kapoor.For the event she wore a Madsam Tinzin outfit.She finished her look with Radhika agarwal earrings and The RAD Project clutch.She did well with the outfit! Sridevi kapoor attended Padmasitaa Vivaha exhibition in Theory formal suit.She finished her look with fashion glasses,pointed pumps and hermes white handbag.She looked chic even in 50's. Lakshmi manchu hosted the screening for the movie Angry Inidan Goddesses in Hyderabad.For the event she chose forevernew sequins tops and mixed it with ishafoundation dhoti pants.She looked simple and stylish! Deepika padukone picked sabyasachi couture long gown with black and beige colors for the trailer launch of Bajirao Mastani movie.The actor finished her look with center part hair,smokey eyes,earrings and finger ring.She looked good! Trisha krishnan looked gorgeous in Prathyusha garimella white long salwar suit and kiara jewelry at Cheetaki rajyam premiere show. Rakul preet singh looked beautiful in a green color ritu kumar sleeveless jumpsuit for the premiere of Cheetaki rajyam movie in Hyderabad. Regina cassandra looked chic in a dark ink blue color Swatee singh label gown at Shourya movie first look launch held at Hyderabad.She completed her look with simple diamond earrings and side swept hair! Adah sharma donned a koovsfashion rose floral print dress for the first look launch of her upcoming telugu movie Garam.She finished her look with bershkacollection shoes and watch.She looked good! Karisma kapoor donned a sabyasachi full sleeve blouse chikan sari for International children's film festival event held in Hyderabad.She looked good! Genelia D Souza looked lovely in a yellow tisha saksena yellow collar salwaar kamiz with shimmer border and net dupatta at St Regis opening event in Mumbai.Genelia and Riteish Desmukh pair is lovely! 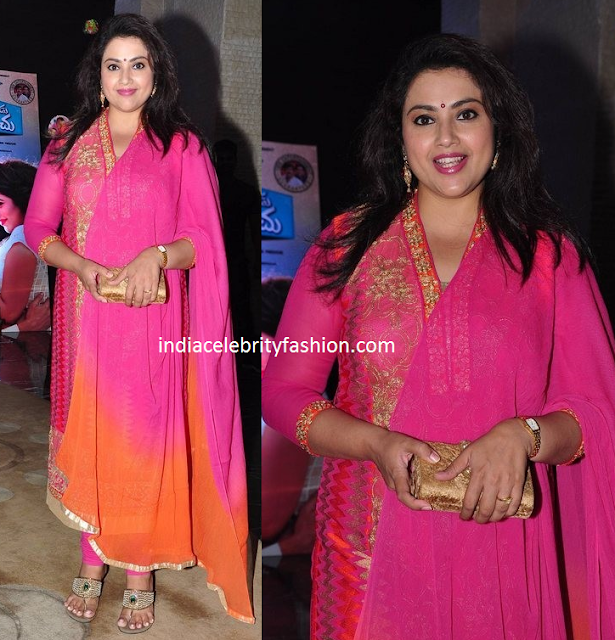 Bhagya shree looked beautiful in a orange and pink shade chiffon saree with silver border and short sleeve blouse at St Regis opening event in Mumbai. Kareena kapoor looked beautiful in yellow manish malhotra full sleeve anarkali suit with white embroidery floral work at Malabar gold and diamonds outlet launch in Abu dhabi. Raveena tandon donned a Anita dongre orange color floor length salwar suit for PNG Jewellers event.She looked good! Vidya balan looked simple and beautiful in yellow color anavila saree at the special screening of angry indian goddesses at Jio MAMI 2015.She completed her look with designer pendant with simple gold chain. 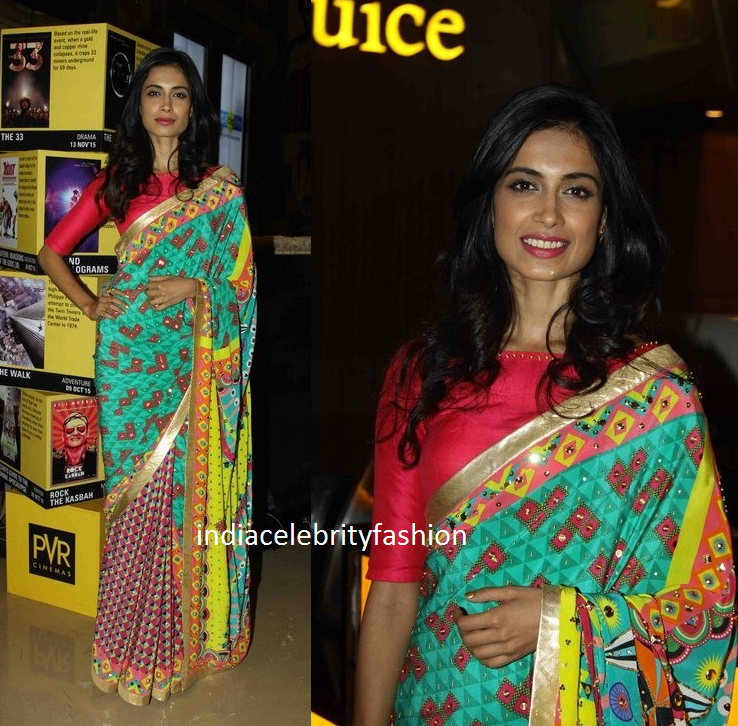 Sarah jane dias looked beautiful in Half and half multi color saree with simple high neck elbow length sleeves blouse at Angry indian Goddesses Special screening at MAMI Mumbai film festival 2015.We love the saree! Hansika motwani looked chic in blue printed jumpsuit at IIFA press conference.She finished her look with short side swept hair,pink lip and black heels. 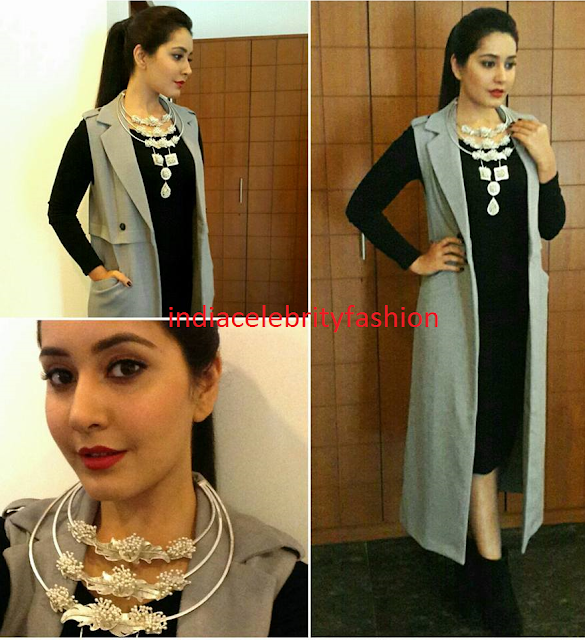 Raashi khanna looked stunning in forever 21 dress at the internal awards of Buliding blocks.She finished her look with ponytail,red lip and suhani pittie stylish jewelry.She was styled by Neeraja kona.Loved her trendy necklace which gave beauty to the dress. Actress Yamini in plain green georgette saree with collar neck elbow length sleeve blouse which is having lace work in the front.Lovely blouse design! The festive season has begun and all are busy in shopping.So for this festive season try out these elbow length sleeve blouse designs for your silk sarees and celebrate the diwali with joy! 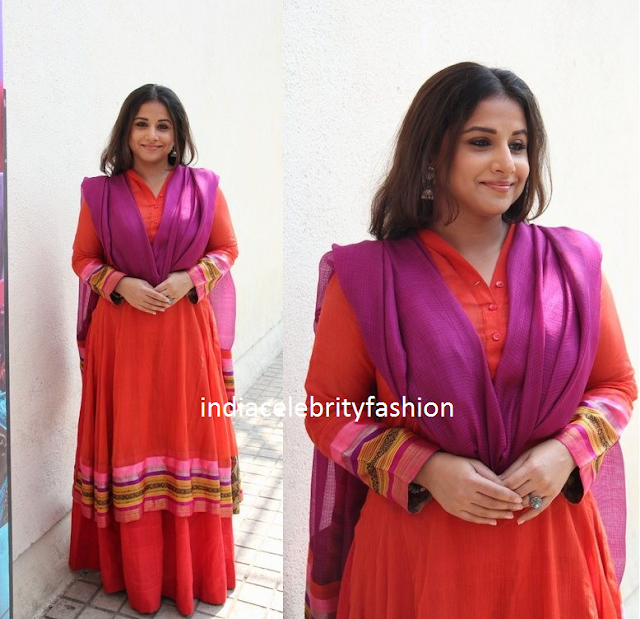 Vidya balan choosed a floor length red full sleeve anarkali suit with purple dupatta for Jio MAMI mumbai film festival event.She looked simple! Tamannah bhatia donned a Gauri and Nainika netted long gown for IIFA Utsavam(International Inidan film Academy) press meet held at Hyderabad. Aliaa bhatt donned a Ikai horse print dress by Ragini Ahuja at Jio MAMI 2015 Mumbai film festival. Sridevi boni kapoor looked beautiful in red manish malhotra salwar suit with rich embroidery work all over and palazzo pant for Karva chauth party at Anil Kapoor's Residence. Trisha krishnan looked beautiful in Sailesh Singhania label lavender silk saree paired with embroidery work short sleeve blouse.She was snapped at the NAC showroon launch in Kanchipuram.She completed her look with elegant NAC Jewellery. 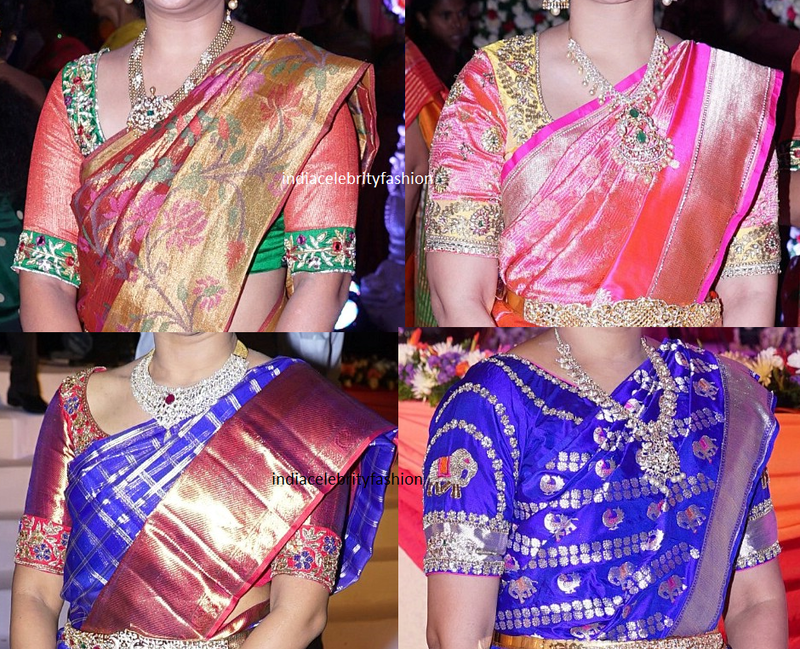 Trisha krishnan recently launched Nac jewelry showroom in Perambur.For the event she donned a beautiful pastel anushree reddy floral lehenga with net dupatta.The actor finished her look with puff hair and nac jewelry.Loved her beautiful Lehenga! Deepika padukone looked lovely in floral design Anamika khanna floor length top,zara jeans and louboutinWorld purple shoes at Tamasha music launch.We love her floral top! Sonal chauhan donned a black crop top and long skirt with gold leaves design by prathyusha garimella at Size zero audio launch.She completed her look with gold designer earrings by kiara jewelry and red lip.She looked good! Now a days we are seeing Anushka shetty wearing kurta majority of times.But for all fans of Anushka,here is the photo of her in beautiful half and half net pallu saree with half sleeve blouse.Anushka shetty was snapped at Size zero audio launch.She went minimal with accessories as always.She looked good! 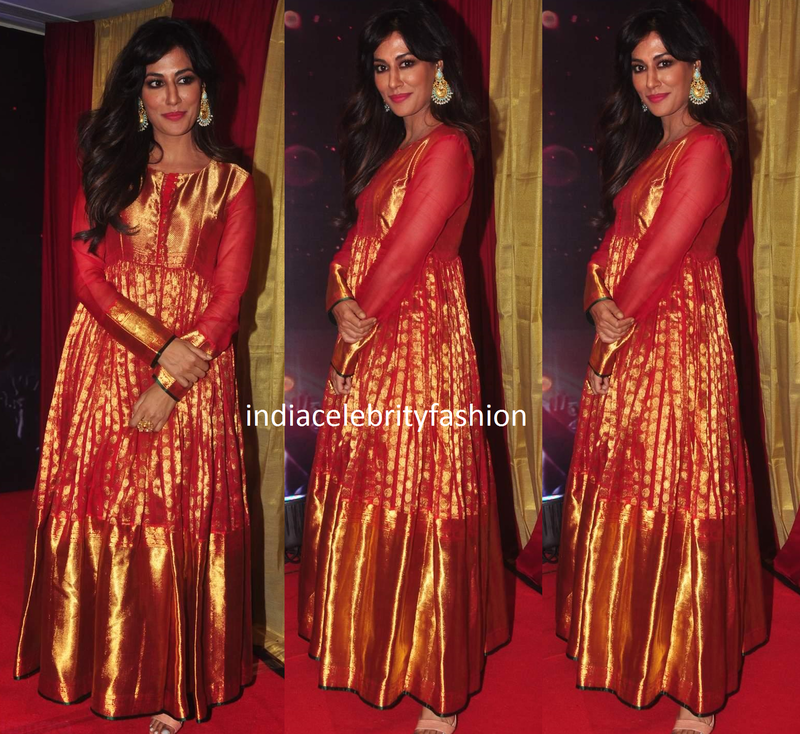 Chitrangada singh looked good in a red kanjivaram anarkali by Gaurang shah with broad gold zari border and full sleeves at a recent country club's event. 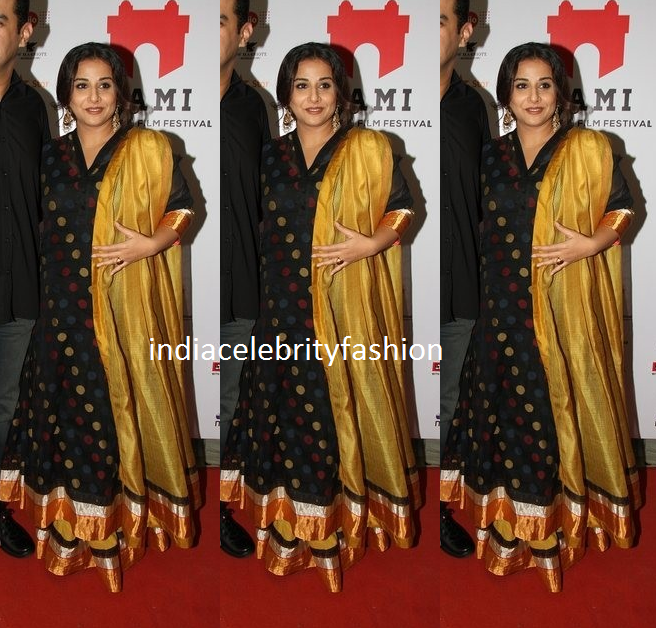 Vidya balan donned a polka dot black and gold salwar suit at Jio MAMI Mumbai film festival.She looked simple!